Join Us February 28, 2013! The "AIM for the Sky" hands on workshop will show that the Autodesk Infrastructure Modeler (AIM) is not just about pretty pictures. AIM can also be used as a preliminary design analysis tool. Join us to find out how AIM can quickly do surface analysis and get area calculations, then see how to convey your design by developing a quality video to present to your clientele. Autodesk Infrastructure Modeler (a.k.a. AIM) is pre-construction visualization software that can aid in civil engineering, transportation, and urban planning. The software helps to create, evaluate and communicate proposals prior to construction. It can also be helpful in driving stakeholder buy-ins. The decisions of the stakeholder buy-ins can be made with visualization proposals for transportation, land, water, and energy projects. Todd Rogers worked in the Civil Engineering field for 16 years before he made the transition to become a certified Autodesk Instructor and Support Specialist in 2007. Todd is a Certified Partner Service Expert (P.S.E.) in multiple Autodesk platforms. He provides hardware and software solutions for customers using engineering applications within different engineering principles. Todd is a leader in customizing company standards to fit their everyday workflow and creating solutions to problems due to software or hardware error. What Styles and Settings are in My Template or Drawing? Ever wonder what it would be like to have a list of all the styles and settings inside your drawing or template file? We all have at one point I’m sure. Well it can be done. You can actually output the styles and setting to a .txt file for review. Alternatively, you can choose the SCREEN option to have them placed in your drawing area. I do not recommend the latter. A .txt file works much better, and faster. The command to do this is DUMPSTYLESANDSETTINGS. There you have it, a nice list of all the styles and their settings. Hello fellow Texans. I have created a forum for all the Civil 3D users in Texas to post to on LinkedIn. If you request to join, I will gladly approve you and you can start posting. To join the group click here. Happy 2013, everybody. I hope your new year is full of new experiences and a plethora of good times. I am going start off the year with an article on license compliancy. The Autodesk Design Suites have become widely used and it is important to recognize a fundamental limitation when installing them. The guidelines are pretty basic but important. It can be easy to misunderstand what you can and cannot do when installing the Suites. Autodesk has a Design Suite family developed to provide adequate design tools for most major industries. The idea is that you have access to multiple programs to address specific needs on your projects. A Standard Suite generally addresses 2D drafting needs. The mid-range Premium Suite builds off the Standard and also provides modeling and visualization functionality. The Ultimate Suite builds off the Premium Suite and provides a variety of analysis tools, depending on the Suite. Make sure you do not over install your Autodesk Suite products. The outcome could raise a red flag with the Autodesk compliancy team. If you are found in violation of the installation terms, you will have to purchase according to the number of over installations you have. Based on the Suite package of your choice, you are allocated a selection of products. A single Suite package is registered under a single serial number. It is important to understand that there are some restrictions to how the Suites can be installed. You are at liberty to install the products of your choice, provided they are included in your Suite. For example, if you have the AutoCAD Design Suite Premium you can install AutoCAD, AutoCAD Raster Design and Autodesk 3ds Max Design. At the front end of the install, you are prompted to select the products you wish to be installed. If you are not going to ever use Autodesk Mudbox in your day to day projects, you do not have to install it. You are not at liberty to install the different products on different computers then use the products concurrently. Using the AutoCAD Design Suite Premium as an example again, you cannot install AutoCAD, AutoCAD SketchBook Designer and Autodesk 3ds Max Design on separate machines and use them at the same time. This is a violation of the End User License Agreement. If you install and activate your Suite products spread out across multiple machines, you are in fact installing the license multiple times. 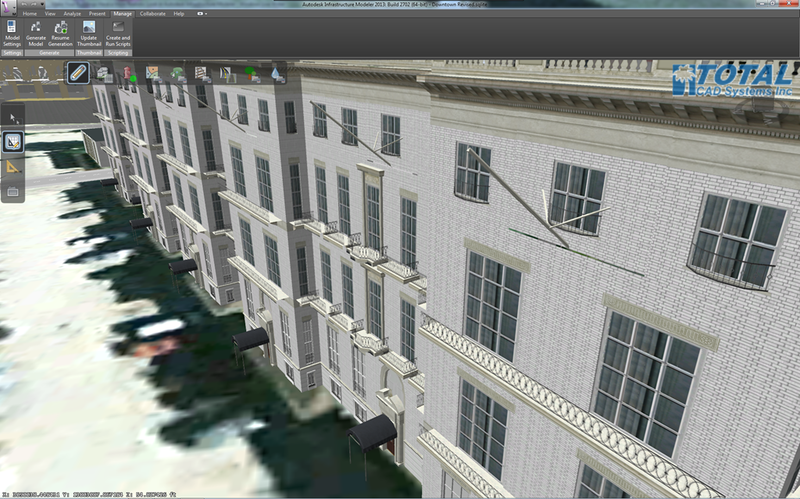 This is will be flagged if you are audited by the Autodesk Compliance team. Each installation and activation will show as a complete install of the Suite. The Suites are not designed to give multiple people access to the products under one license. The Suites are designed to give one user access to multiple products. If you have one license, that one license can only be activated on one machine. Remember, one Suite, one install. 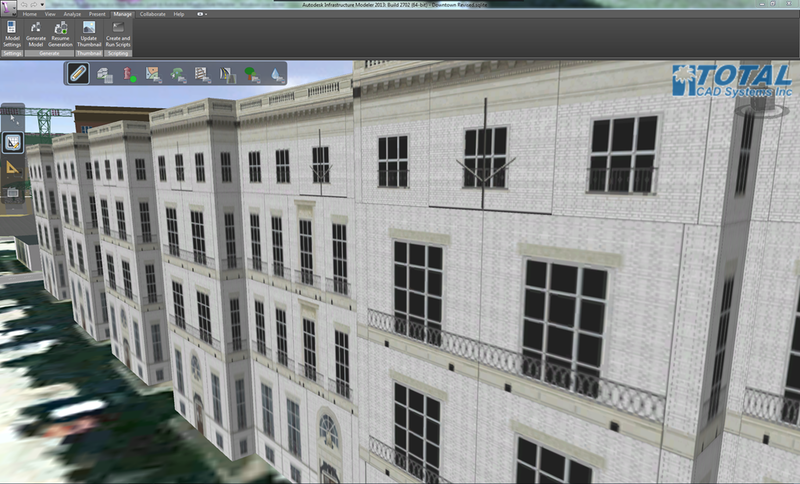 There is a setting in Autodesk Infrastructure Modeler (AIM) that will give more depth and detail to your buildings. Note that the building looks absolutely fine. BUT, there is a way to get more detail out of this. For instance, look again at the balconies. Wouldn’t it be nice if they were actual balconies and not just an image draped on the structure? This can be accomplished very easily. 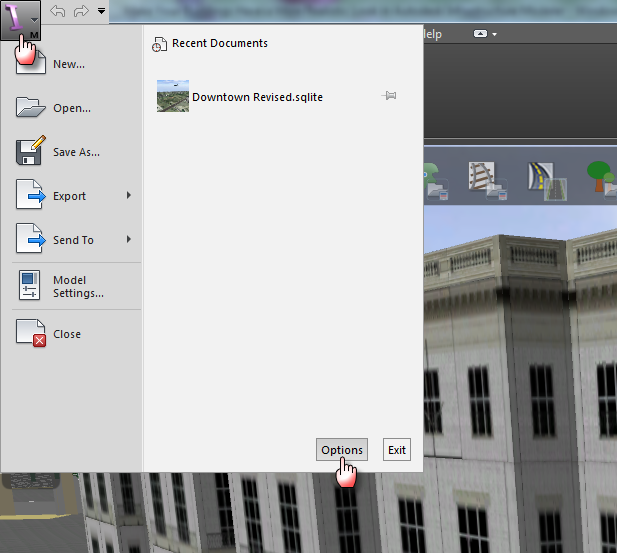 Once in the Options dialog box, choose 3D Generation. To the right, change your Building Complexity to High and select OK. The changes will not take effect until you regenerate your model. To do this, click on the Manage tab. 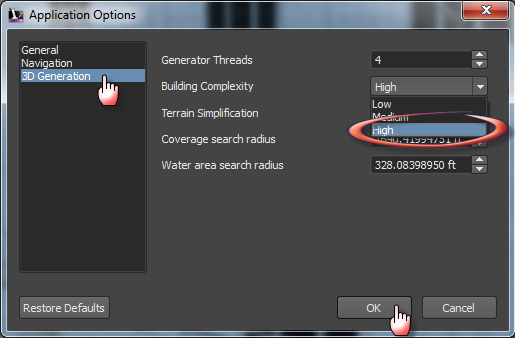 Under the Generate panel, select Generate Model. Notice now that the balconies are actual balconies and the windows have depth to them. You can also see that the poles are now objects projected from the building. Happy New Year, good luck and check back often.